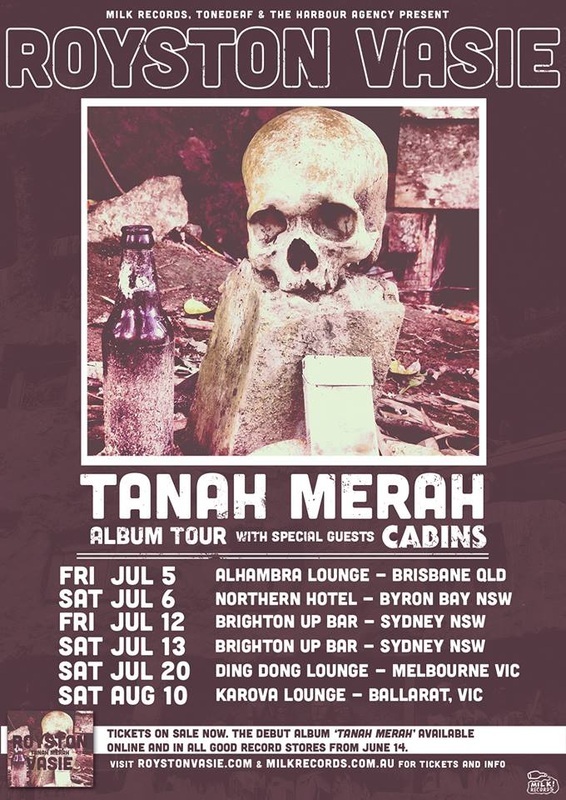 Royston Vasie are excited to announce the release of their highly anticipated debut album Tanah Merah, which will hit stores on the 14th of June. As a thank you to fans, the band is giving a taster of their new allbum, with the addictive new track Inside available on their Soundcloud page. The swirling vocal line, grunge-ridden guitar riffs and captivating chorus guarantees Inside as a difficult tune to forget. It’s the hard-hitting sound that fast made the Melbourne band both a triple j favourite, and of the one of the most surprising live acts on the scene. After selling out Melbourne’s iconic Northcote Social Club and Sydney’s Oxford Arts Factory on their previous single tours, Royston Vasie jumped straight back on the road to complete a national jaunt with the talented likes of Ben Kweller, Manchester Orchestra and the critically acclaimed Afghan Whigs. Adding to their list of shared stages including British India, The Cruel Sea, The Vasco Era and Wolf & Cub. In honour of Tanah Merah, Royston Vasie will hit the road once again with special guests, Cabins, in tow. The tour hits Brisbane, Byron Bay, Sydney and Melbourne in July. Tickets on sale now.